What is the best way to incorporate olive oil into your diet and reap its healthy benefits? In this section, we summarize some facts about food pyramids and the Mediterranean diet. We also recommend you read our pages on How to Pick an Olive Oil and Cooking with Olive Oil. 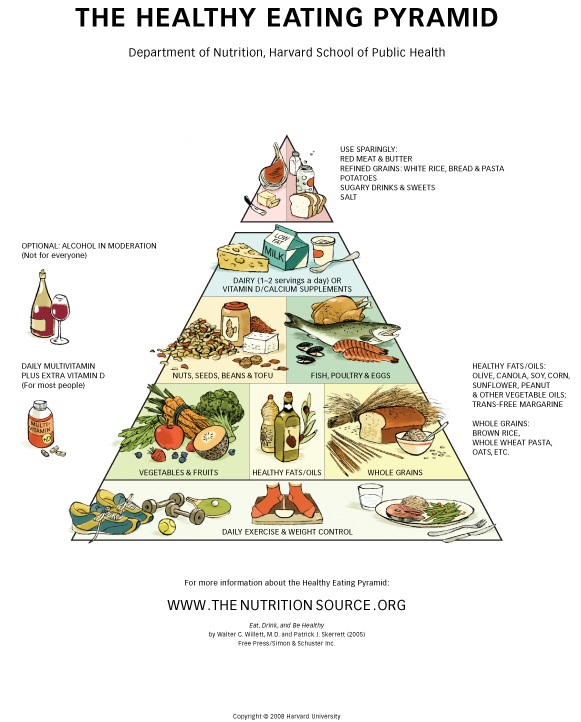 The Harvard pyramid is based on the Mediterranean diet. Its structure came from the diets of the inhabitants of Crete and Southern Italy in the 1960’s. The study was presented in 1993 by Walter Willett of the Harvard School of Public Health at the International Conference on the Mediterranean Diet held in Cambridge Massachusetts. Note that oil is one of the basic components, in direct opposition to the current USDA pyramid. This pyramid has enjoyed a decade of increasing acceptance. What is the key to a healthy diet?According to the Harvard Medical School Food Pyramid, the total amount of fat you eat, whether high or low, is not really linked with disease. What really matters is the type of fat you eat. The "bad" fats -- saturated and trans fats -- increase the risk for certain diseases. The "good" fats – mono-unsaturated and poly-unsaturated fats –- like those contained in olive oil lower disease risk. The key to a healthy diet is to substitute good fats for bad fats, and to avoid trans fats. Olive oil is an integral part of the "Mediterranean diet" which is associated with sensible tasty portions and slower, more enjoyable eating. People who eat a "Mediterranean diet" have been shown to have a remarkable variety of health benefits. The olive oil in the Mediterranean diet can quickly satisfy hunger and lead to fewer total calories ingested at mealtime. It is unclear if any single component of this diet is responsible for these health benefits or if it is a combination of olive oil and a diet high in vegetables, fruit and fish. Extra virgin olive oil is one of the few oils that can be eaten without chemical processing. (Nearly every other vegetable oil has been detoxified and refined with steam and solvents). Fresh pressed olive oil can be eaten immediately and retains the natural flavors, vitamins, minerals, antioxidants, and other healthy products of the ripe olive fruit. Most doctors advocate lowering total fat and calories in your diet, and substituting butter, margarine and tropical oils with healthy fats like olive oil.